This is a genuinely nice story. I met Ellouise at a pub in Brisbane's west two weeks ago. She was hosting a function to raise money for a Ride to Conquer Cancer event she was due to take part in the following weekend. She'd been expecting sixty guests. Only ten came. I felt desperately sad for Ellouise. I've had that horrible sinking feeling when you've planned something, made an effort, tried so hard to capture people's attention... and fallen short of what you wanted to achieve. 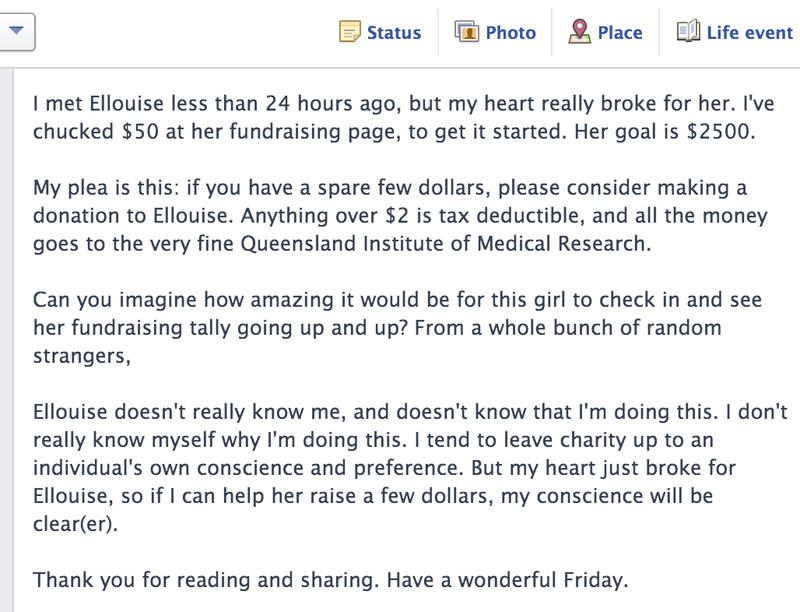 I chatted with Ellouise's mum, who gave us the background on why she was holding the fundraiser. Ellouise's Dad had died four years previously after fighting a brain tumour. This charity bike ride, which raises money for research centre QIMR Berghofer, was the first thing she had done to try to pay tribute to her Dad's memory. While the guests who did attend evidently loved and supported Ellouise, her mum was worried the low turnout would negatively affect her daughter going into the ride... and beyond. I went to sleep that night thinking of Ellouise - such a sweet young lady trying to do a good thing. The next morning, I interspersed regular work with a bit of amateur sleuthing/stalking. I was able to track down Ellouise on Facebook, then get a media contact at QIMR Berghofer to find her official Ride to Conquer Cancer fundraising page. That was another gut punch - there were no donations recorded, despite a $2500 fundraising goal. I was hoping a few people might feel generous and we could raise a few hundred dollars. I went back to doing my work, and when I checked back a few minutes later, the tally was already at $120. Then it was $360. Then $480. Then $530. It kept going up. And up. The tally was over $800 a mere 30 minutes after my original post. Friends on Facebook liked my post, then shared it. Friends of friends starting posting comments saying they were chipping in. Other friends popped up on my Facebook chat to give me running updates on the tally. Something about Ellouise's story simply swept people up, and so many joined in the fun of what one friend described as "the best kind of practical joke on a stranger". An hour or so after my post went up, I told my deputy editor and asked if I could do a short story on the Ride to Conquer Cancer for Brisbane Times. She agreed, so I spoke with the head of QIMR Berghofer about the event - and then I rang Ellouise. She remembered me from the night before; I explained that I was a journalist and that I wanted to interview her as a participant in the ride. She seemed chuffed and we had a good chat. Just before I let her go, I asked Ellouise how her fundraising was going. She replied that her internet had been down and she hadn't had a chance to check before heading out to pick up her bike and other equipment for the ride. 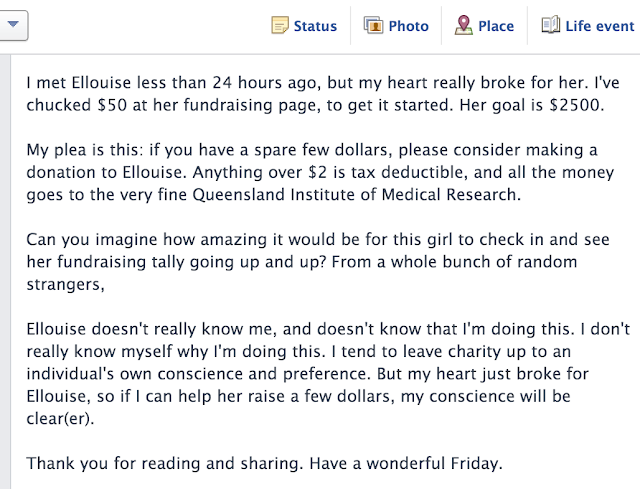 By this point there was well over $1000 in donations to Ellouise's campaign - and she had no idea. While I wrote my story, the Facebook post kept being shared, and donations kept flowing in. I left work around 4.00pm to head to the ABC, where I do a regular Friday afternoon segment. At that point, a work colleague filled my boss in on the social media blitz - and he suggested we put the post up on the Brisbane Times Facebook page. This extra boost put it in front of thousands more people, many of whom jumped right onboard the fundraising wagon. By the time I finished at the ABC at 5.00pm, Elouise had surpassed that magic $2500 mark. It was, simply put, the best feeling I'd had in a fair while. I couldn't stop smiling. The donations continued into Saturday morning, when a relative of Ellouise commented on the Brisbane Times Facebook page that she had seen her tally erupt and was pumped and "riding her heart out". In total, friends, friends of friends, and friends of friends of friends donated $3000 to young Ellouise - a stranger to them. It was a really wonderful credit to all of those good-hearted people, and gave me a real buzz about humanity in general. On Thursday, two weeks to the day after I met Ellouise, I received an email from her. She had completed the ride - or as she called it "a small journey of significance" - despite a flat tyre just metres after the starting line, and other gear problems along the way. I just want to say the most biggest THANK YOU to you for helping me out in the Conquer Cancer fundraising. As soon as I got home from the day you called me to check the donation website, I was completely overwhelmed with the generosity and support I had. It went above and beyond. I went to call you back but never could get through, but my mum had found out about an article you had posted in the Brisbane Times. Thank you for doing such a wonderful thing. As I cycled the ride it felt great to know that so many people cared and were truly passionate in fighting to conquer cancer. I'm sure my father was watching over me at the time I met you. And yes, that may have made me tear up. They often say there aren't a lot of good news stories out there. I'm so pleased I got the opportunity to help make one happen. Thanks again to all those who donated, and all the credit in the world to Ellouise for her strength and love for her Dad.